The District of Kitimat Friday afternoon lifted the boil water advisory declared during a heavy rain storm late last Saturday. The District says system flushing may result in some discoloured water, but it is safe to drink and the water should run clear quickly. The precautionary boil water advisory issued on Sunday, October 11 has been lifted. 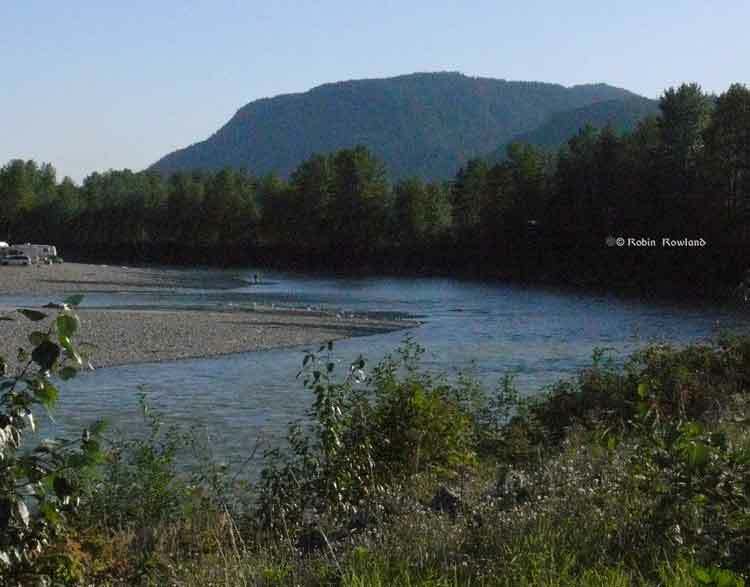 This advisory was issued by the District of Kitimat, with advice from Northern Health, after the extremely high flood levels in the Kitimat River caused an increase in turbidity in the municipal water supply. It has now been lifted after two consecutive sets of samples confirmed there was no total coliform or E.coli contamination in the potable water. Chlorination was increased and maintained over the boil water advisory period and municipal crews flushed the water system to speed up removal of the turbid (cloudy) water. The flushing itself could result in some discoloration of the water but it is safe to drink without boiling. If your water is discoloured, let your cold water run until it clears. The District of Kitimat apologizes for any concern or inconvenience this precautionary measure may have caused. A group of biologists from across Canada have proposed a nine step program to sustain healthy waterways and fisheries not only in this country but around the world. The key to clean waterways and sustainable fisheries is for the management plan to follow nine guiding principles of ecological water management, according to John Richardson, a professor in the Dept. of Forest and Conservation Sciences at the University of British Columbia, one of 15 freshwater biologists who created the framework to help protect fish and ecosystems into the future. Fish habitats need waterways that are rich in food with places to hide from predators and lay eggs, according to the framework published on January 31 in the journal Environmental Reviews. “Fish are strongly impacted when nutrients, sediments or pollutants are added to their habitat. We cannot protect fish without maintaining a healthy freshwater ecosystem,” Richardson,who led the policy section on protecting fish habitats, said in a UBC news release. Other policy sections addressed areas such as climate change and biodiversity. Read the complete paper on the Environmental Reviews site. Humans have put key waterways at risk because of land development and the loss of the vegetation along rivers and streams, Richardson said, adding connecting waterways are also critical for healthy ecosystems. “If fish can’t get to breeding or rearing areas because of dams, culverts, water intakes or other changes to their habitats, then the population will not survive,” he said. With more pressure on Canada’s waterways, Richardson and his colleagues wanted to create a framework of evidence-based principles that managers, policy makers and others could easily use in their work. “It’s a made in Canada solution, but the principles could be applied anywhere in the world,” he said. Freshwater ecosystems are among the most imperiled on Earth with extinction rates of freshwater fauna higher than for many other ecosystems and vastly exceeding historic background rates/ Freshwater is vital to humans, and clean water is rapidly becoming a limiting resource for many societies. The greatest threat to freshwater ecosystems is the loss or alteration of freshwater habitats through human development yet our societies and economy depend directly on the services provided by healthy freshwater ecosystems. Most ecosystem services of fishes are supported by a diverse fauna, not by merely the few species directly favoured by humans. Humans live side-by-side with fishes and other aquatic organisms in watersheds, and we derive our quality of life from the health of these ecosystems. Recent changes to Canadian fisheries policies have motivated responses by the public and the scientific community yet a broad contemporary scientific assessment of what is required to manage freshwater fisheries resources is lacking. A template of the core ecological concepts underlying sound fisheries policies, based on the best available science will support policy and management decisions and the design of monitoring programs to evaluate the success of these actions. With more pressure on Canada’s freshwater ecosystems, Richardson and his colleagues wanted to create a framework of evidence-based principles that managers, policy makers and others could easily use in their work. “It’s a made in Canada solution, but the principles could be applied anywhere in the world,” he says. Healthy freshwater ecosystems are shrinking and reports suggest that the animals that depend on them are becoming endangered or extinct at higher rates than marine or terrestrial species, says Richardson. Humans also depend on these ecosystems for basic resources like clean drinking water and food as well as economic activity from the natural resource sector, tourism and more. Ensure that decision-makers have the capacity, legislation and authority to implement policies and management plans. A map issued by the US Environmental Protection Agency showing pockets of submerged oil found in the Kalamazoo River during summer 2011 cleanup operations (EPA) Click on map for larger version. cleanup and monitoring work expected to last through 2012”. EPA news release. Failure to comply could result in civil penalties. The local newspaper the Battle Creek Courier quotes an EPA official as saying agency has learned a lot in the 14 months since the Enbridge pipeline burst, contaminating five acres of land, part of Talmadge Creek and 35 miles of the Kalamazoo River. The order was based on what the EPA has learned in the past few months. Most of the remaining oil is submerged at the bottom of the Kalamazoo River or on about 200 riverbank sites that haven’t had work done yet, Dollhopf told the paper. The EPA also is asking Enbridge to install “passive collection devices” in areas where oil commonly accumulates in the river, Dollhopf said. Oil remaining in the river tends to mass at natural deposit points — most commonly near dammed areas. The EPA says the work will continue to the end of 2012 and even into 2013 if necessary to remove as much remaining oil as it can without harming the environment. Some parts of the river may be reopened to the public in 2012. To date, more than 766,000 gallons of oil have been recovered and 113,000 cubic yards of contaminated soil and debris have been sent to EPA-approved disposal facilities. Enbridge will be required to repay the government for all response costs. Revisiting shoreline areas cleaned up in 2010 where winter weather and spring floods exposed previously unseen oil or spill impacts. Excavating oil contaminated soil and weathered tarry oil from the overbank areas. Recovering pockets of submerged oil in the sediment. EPA has identified three major submerged oil areas including the delta leading into Morrow Lake. Salmon have extra large guts–up to three times larger than its body would suggest–that help it survive, scientists at the University of Washington say. The study “Excess digestive capacity in predators reflects a life of feast and famine” is published in Nature. The study is by PhD student Jonathan “Jonny” Armstrong, originally from Ashland, Ore, who says he has been fascinated by salmon ever since he saw a Chinook leap out of the water when he was ten. “This much excess capacity suggests predator-prey encounters are far patchier – or random – than assumed in biology and that binge-feeding enables predators to survive despite regular periods of famine,” Armstrong said. Co-author and supervisor on the paper is Daniel Schindler, University of Washington professor of aquatic and fishery sciences. “Guts are really expensive organs in terms of metabolism,” Armstrong said. For instance, maintaining a gut can require 30 to 40 per cent of the blood pumped by an animal’s heart. Some animals have some capacity to grow or shrink their guts in response to changing conditions. For example, according to previous studies, the digestive organs of birds that are about to migrate expand so they can eat more and fatten up. This is followed by a period when their guts atrophy and then, freed of the baggage of heavy guts, the birds take off. But this study shows that many fish species maintain a huge gut, which enables them to capitalize on unpredictable pulses of food. Ravens and crows, for example, are known to cache food far from where they find it. Fish can’t do that. “Unlike some other animals, fish can’t just hoard their food behind a rock in the stream and eat it later. They need to binge during the good times so that they can grow and build energy reserves to survive the bad times,” Armstrong says. Armstrong is part of the university’s School of Aquatic and Fishery Sciences which has a field site at the Alaska Salmon Program’s Lake Aleknagik. Using a dry suit, Armstrong snorkeled the Aleknagik tributaries, swimming in waters as low as 5°C where he found out the Aleknagik streams exhibited tremendous variation in water temperature, which inspired him to study how those temperatures affected the ecology of the streams. The “previously unrecognized survival tactic” might apply to other top predators, such as wolves, lions and bears, Armstrong says. The sale of oil and gas tenures in northeast British Columbia by the provincial government for $260-million is being challenged in court by a native band. The Dene Tha, a first nation that straddles the B.C.-Alberta-Northwest Territories boundaries, has filed a petition with the Supreme Court of B.C. The band alleges that the B.C. Ministry of Energy and Mines failed to adequately consult with the first nation, or to undertake studies on the environmental impact of gas drilling, before selling the leases in the Cordova Basin, near Fort Nelson. Shale-gas deposits in the Cordova Basin are thought to be extensive.